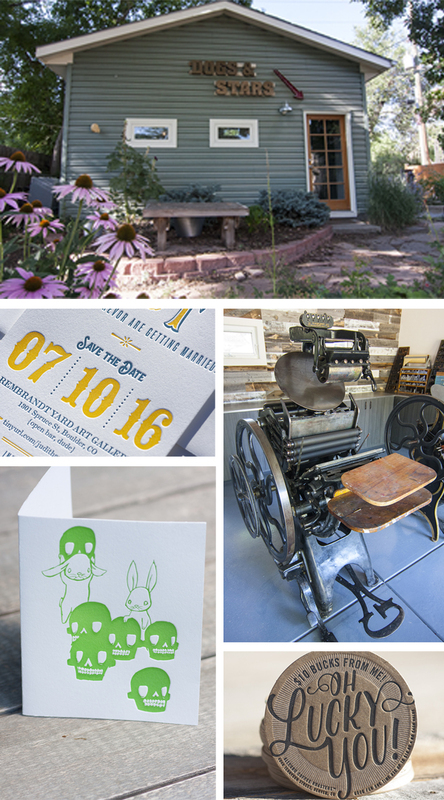 Lafayette, Colorado is an award winning small city where Dogs & Stars letterpress shop calls home. This “Best Place for Young Families” and “Top Fifty Best Places to Live” community is an inspirational place for the edification and admiration of letterpress printing. Brian Wood of Dogs & Stars is banking on that to advance his craft in his new workshop. 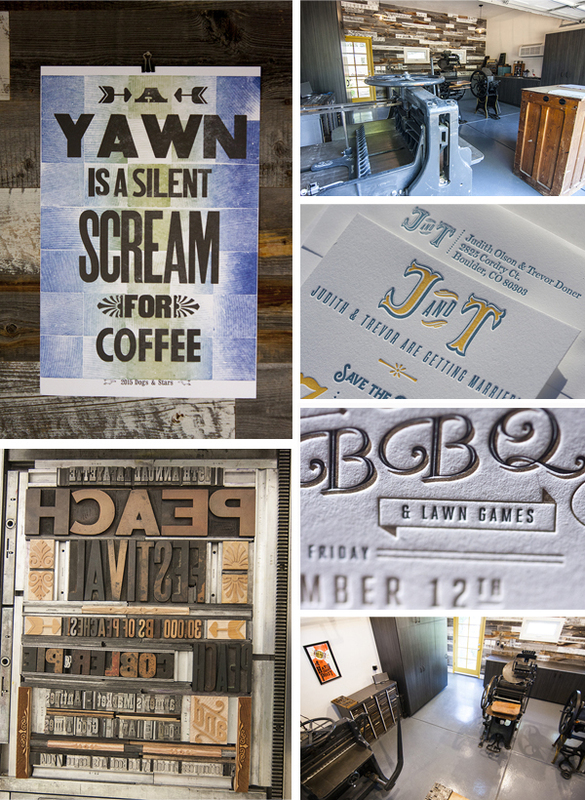 Getting into letterpress has evolved over a ten year period for this graphic designer. His early influence was old letterpress posters with inspiration drawn from wood type. HUMBLE BEGINNINGS My first press was a Showcard 8×12” sign press. I took over our second bedroom and started a very makeshift shop, continuously adding the needs of a print shop bit-by-bit, eventually resembling a studio of sorts. Once more equipment and type cabinets arrived it was time to take over the next logical area of our home – the garage. The shop has undergone a recent renovation thanks to the generous Kickstarter community. Before the conversion it was just a basic garage with letterpress stuff in there. It now features reclaimed chicken feeder lights, recessed can lights, solar tubes and four windows for lighting. The garage door remains, so it can be opened up during the warmer months for both natural light and fresh air. A fellow printer once told me to paint the floor to help improve temperature control. So the floor is painted a nice blue-gray using epoxy paint, so it’s durable as well. THE SIZE AND LOCATION Our house had a 2 car stand alone garage that I have converted into a fully functional 400 square foot letterpress shop. It’s in the back of the yard so it’s tucked away. We live in a historic area of town that is starting to see some really cool shops, breweries and restaurants opening. I’m about 2 blocks from a coffee shop that carries my greeting cards and also hosted a letterpress poster show of mine. The local arts community is very supportive in Old Town Lafayette. There’s an excellent brewery less than 5 blocks away as well. I’m in good company. THE PRESSES The work horse is a Golding Jobber No. 7 (10×15). I also have 3 sign presses: A Showcard, Nolan and Fremont. And a Golding Pearl that needs parts. NUMBER OF PRINTERS IN THE SPACE It’s a one-printer show right now. It’s open by appointment only at this point due to location. But I’m happy to host anybody who wants to see what I have going on. FAVORITE THING ABOUT THE SHOP My prized possession would have to be a toss up between my Golding Jobber No. 7 and the cabinets we had installed. They are impressive and have created an organized workspace for me. The Stik Wood reclaimed wood we installed on one wall is warm and inviting and everyone who visits loves it. MOST VALUABLE SHOP TOOL I really value my quoin key. Without it, I would not be able to print on my platen press. My base and plate are the 6 x 9 boxcar base and the Jet 94FL plates. PIED TYPE I do have some pied type floating around my shop, but I let it lay. FAVORITE INK I use Van Son rubber based inks. My current favorite color is Warm Red. It always seems to cooperate, looks great on the press and prints well. CLEAN-UP ROUTINE Boy, do I hate cleaning up. I use kerosene with Scott shop towels to clean up the majority of my mess. I use a paint scraper to get up ink on the ink disk and mixing stones. ORGANIZATION ADVICE I do a good solid clean up after each project so things don’t get too hectic going forward. PRINTING ADVICE Know your presses and what the limits are. Knowing what you can and can’t do on your specific press from the beginning can be helpful carving out your niche in the letterpress world. Brian’s work at Dogs & Stars Press will continue to be type-driven and he laments that he was a few decades late on being a lino-type operator instead. Thanks for the insight and look into your creative new workspace. This entry was posted in Shop Talk, Work Spaces and tagged Brian Wood, Colorado, Dogs & Stars, Letterpress Is Fun, letterpress printing, workspace profile by Cathy. Bookmark the permalink.